Triposo, best known for its Android(s goog) and iOS(s aapl) travel guides, launched an Indiegogo campaign on Friday to help fund the Travel Belt, an actual wearable belt that can help guide you to your destination by vibrating while you are wearing it. Before I get into how it works, you can see what it looks like in the video below. Note the Belt doesn’t appear until around 45 seconds in. According to Triposo, the Travel Belt in the movie is a real working prototype. 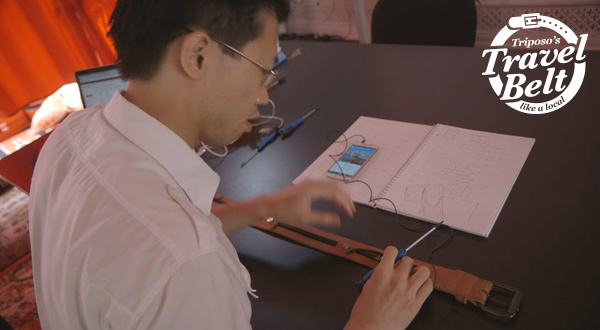 Thankfully, the prototype looks a lot like your standard issue brown leather belt, as opposed to something more attention-grabbing and futuristic. This will at least present the image of normalcy while you are walking around blindly, waiting to feel a vibration. Here’s how it works. The belt comes with a 3.5mm cable, which allows it to connect to your phone’s headphone jack. This also makes it compatible with any device that can run Triposo’s app (Android and iOS editions are planned at the moment). Once plugged in, fire up the app, tap on buzz me there, and as soon as the app knows where you are and where you are going it will send you on your merry way. The Belt will trigger one of four vibration motors to indicate whether you should go back or forward, or turn right or left. I actually think this is pretty neat, if a bit strange. I like that it uses your phone’s headphone jack, which reminds me of the Pressy button; Triposo claims this should keep the power drain at a lower level than Bluetooth. But I worry about those vibrations. I can’t count the number of times I thought I’ve felt my phone vibrating, only to realize it wasn’t even in my pocket. Or how many times I’ve missed a call when my phone was set to vibrate and it was in my pocket. Triposo needs to make sure the motors produce a vibration strong enough to be unmistakably felt. But what really gives me pause is this part of the pitch on Triposo’s Indiegogo page: “It may not be as sophisticated as a turn-by-turn route planner and it might just send you down a couple of streets you had not planned on seeing, but that’s part of wandering.” I actually think that’s called getting lost. If someone traveling wants to take the scenic route, they can just turn the belt off for a while and wander around on their own. Still, I can’t help but be intrigued by a device as novel as the Travel Belt. I can picture walking through the streets of New York City, seeing a group of tourists all wearing the same brown belt, brows furrowed in concentration as they wait to feel a vibration for their next turn.